Little Acre is seeking a seasoned manager to take ownership of our growing weekend and events operations. 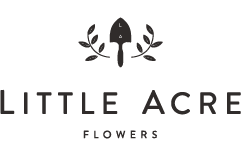 The Studio & Events Manager will report to and work closely with Little Acre’s General Manager to fulfill weekend deliveries and oversee in-studio operations, as well as support event floral production. Floral design and fulfillment: Manage weekend design and delivery staff and processes including purchasing, order processing and delivery tracking. Help with executing floral designs. Customer service: Manage all customer correspondence channels (email, phone, social media) through part-time staff and directly as needed. Strong aesthetic sense; loves a good Instagram feed ad much as we do! This is a fast-paced role with a starting hourly commitment of 20-25 hours/week, with a fast ramp up to full-time hours / salary if growth targets are achieved. Must be able to work most Saturdays. Compensation commensurate with experience and will include commission on event-related sales. If you think you might be our next team member, we want to hear from you! Send your resume and cover letter to our General Manager: amber[at]littleacreflowers.com.